This post contains my thoughts and feelings concerning Mano Erina as an Idol of Hello! Project before her graduation, how I came to like her and what she means to me as a fan of Hello! Project in general. This is an Appreciation post written to appreciate an Idol who came to be a part of my ever-growing Idol fandom. If this sounds like rambling it's because I am tired. Say what you will about Mano Erina, whether it be that she lacks as a singer talent wise or that she should have never been the soloist of Hello! Project, because no matter what you say or think, I like her. Sadly, this was not always the case. I became a fan of Mano Erina when the PV for her newest single back then was leaked onto the internet; that single was Seishun no Serenade, a fun and peppy tune which really sparked my interest in Hello! Project's sole soloist. After that I became a sucker for anything she released, though My Days for You is the song and video that really stole me away and made me decide that I wanted to be a fan of hers. But before Seishun no Serenade was released, I payed little to no attention to Mano; in fact, I never wanted to know who she was. To me she was just some random girl in H!P who I did not care for... much like the other groups that weren't Morning Musume or Bump.y at that time. 2011 though was one of my dimmer times when it came to looking at Idols because of how selective I seemed to be with who I listened to. Mano was no exception, but as I said, it was Seishun no Serenade which really allowed me to start enjoying her music thanks to the fun and catchy tune that was so easy to dance to and enjoy, though I aimed to only become a casual fan and not fall in love with her like I did. Of course My Days for You changed how I felt about her. To this day this has to be my favourite song and PV of Mano's, as well as the one PV in all of Hello! Project which I enjoy and rate highly; it's beautiful, and when it was released I really felt that it captured the essence of Mano and her beauty whilst also hinting at her maturity as an Idol. It's also my favourite song of hers, being the song that really drove me to want to know more about her and fall in love with her more, and the song that I think fitted her voice perfectly back in 2011. The release of this video and PV just allowed me to realise how perfect Mano could be, and how wrong I was in trying to ignore it. If anything, this PV allowed me to see the error of my ways, and whilst I don't find Mano to be the best singer, I really grew to like her after this PV. Just seeing this natural side to her and her maturity made me like her more, and I knew that I was a sucker then. It's so peaceful and beautiful and just reflects the softer side to Mano that Seishun no Serenade masked. At the time it was released, I felt that this was the perfect song and video to introduce Mano as an adult, and the simplicity won me over and really drew me in. I have obviously enjoyed most, if not all, of Mano Erina's releases after the first two songs which allowed me to fully appreciate her as a performer and a singer. Her later releases, though very few of them there may be, are just as wonderful and really show Mano's growth perfectly as both a young woman and a performer; her latest music video's have really shown her maturity whilst also portraying her performance in acting perfectly. Over the past few years since Seishun no Serenade I have seen this undeniable change in not just Mano as an Idol, but Mano as a person too. She has matured and really taken to the camera, her expression and look has changed drastically and I can no longer see that youthful and bubbly girl dancing energetically because she has been replaced by this mature, beautiful young woman who has changed so drastically over a two year period. Her growth is undeniable, and I like that about Mano; she changed so drastically but for the better, and people have noted that over time, just like her age, Mano's songs and video's have changed for the better too. Out of all of Hello! Project Mano has some of the best material and the most freedom when it comes to her video's, and it is these video's that have shown just how good she can be. Not only do the video's show her acting capability, but they also show just how strong of a performer she is; like C-ute is to dancing, Mano is to acting, and her later music video's from 2011 onwards really show off that skill and quality that she has, and it's her acting which has really allowed me to fall in love with her even more. And as Mano got better with each and every song and PV, and with the release of Song for the DATE, I really began to believe that Erina would come into her own and steal the show from every other Hello! Project unit and impress all the fans who had thought she was just another so-so soloist... and then the announcement hit: Mano Erina was to graduate Hello! Project. I didn't cry, I just sat there, completely shocked and unsure of what was happening. I didn't want it to happen, not when Mano was coming into her own and showing off her talent so wonderfully through her new PV's and her great music, but it was happening and I couldn't stop it. After the departure of Niigaki Risa and the sudden graduation of Mitsui Aika I was sure that there wouldn't be another announcement so soon. Well of course I was wrong, and along with plenty of other Wota I was shocked and saddened by the news. But of course I have taken it all in and accepted it, but really, it was too soon; however Mano Erina is an adult, and like all adults she has decided to move on and follow a different dream, one which I will fully support because it is what she is great at, and that's acting. My lord, she is a fantastic actress, and I can only hope she does well in this career because let's be honest, her acting is better than her singing, and her performance skills are amazing, much like Niigaki Risa's acting skills. However I am still sad that she is leaving, and really, it feels like it is far too soon to be saying goodbye to Hello! Project's sole soloist of nearly 6 years. I haven't known Mano long, heck I haven't known Hello! Project long at all if you really think about it, and whilst I know that this graduation won't be as important to me as Niigaki Risa's was, I know that it's going to sadden me a great deal because I do love Mano Erina. I don't buy her goods, but I don't believe that the amount you adore an Idol is measured in how much you buy, but I do dearly love and cherish her, and she holds a place in my heart as an Idol I greatly love, respect and thoroughly enjoy watching and following. She is an amazing person, and whilst I feel like this graduation is far too soon and sudden, I hope to continue supporting Mano Erina as a talent, actress or singer in the future and hope that her future endeavours will be successful. I may not have followed Mano for long, and I know that I did not experience her early days as an Idol or watch her grow like others did, but from when I started liking her until now, I am happy that I chose that time to start enjoying her music because I was able to experience the sudden change and growth she had, and I was also able to experience the beauty of her music and her maturity as a young woman who was slowly changing from an Idol into an artist. I am happy that I was able to become a fan of Mano Erina and experience her music as I have, and whilst she is somewhat under appreciated and underrated, I feel that her graduation, though sudden, is one which will be memorable; she has stood strong and tall as Hello! Project's only soloist for under 6 years and has grown into a beautiful young woman with amazing performance skills and incredible PV's. I am extremely sad to see her go, and the day that her graduation comes, I will be hit hard with reality because honestly... it still hasn't settled in that she is leaving. It seems somewhat surreal, because I actually felt like there was more time when really there isn't much time left. She has really changed, hasn't she? Hopefully she will continue to change and mature, readily challenging new things and honing her acting skills and becoming a better person. Mano, it's still pretty early to see you go, and I honestly hoped to see you for another year or two in Hello! Project, but the time that I have spent loving you has been great. All I can do now as a fan is hope that you become a great actress and blow Maeda Atsuko out of the water, because honey, you are perfect. 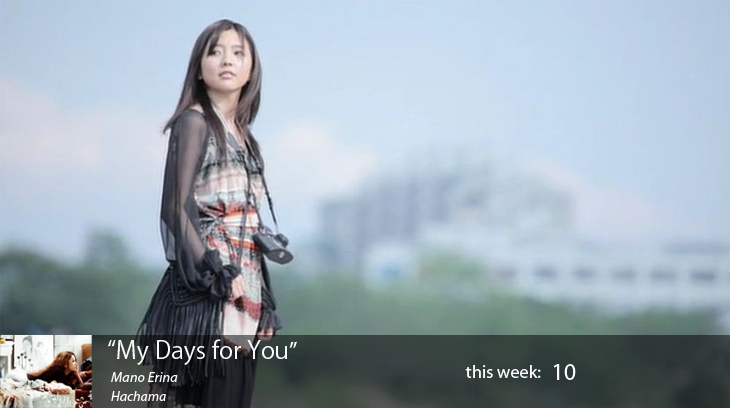 And as a little goodbye, please take a look at the most beautiful video and song I have ever heard from Mano Erina; My Days for You. Still many great things to come for Mano Erina, I'm sure. I wish her well in her acting career. Thank you for sharing your thoughts, Chiima. I hadn't seen My Days For You before and now that I have for some reason it makes me think that in 20 years time it will be a very emotional thing to come back and revisit. I guess it's the nostalgic theme of the song that put me in that frame of mind. My heart aches just imagining it. She will be an amazing actress I think, and from what I have seen her in already I think she will just become better as she acts more because she is really great! And this song is beautiful, my favourite of hers by far, and I think I will cry when I listen to it again in the future (as well as cry to NEXT MY SELF). A great woman that will not be forgotten! She is amazing, and I am sure that she will make her stake in the acting world!